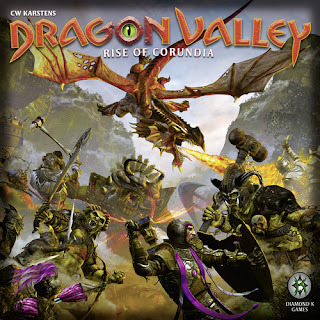 Dragon Valley is a strategy game set in the mythical Kingdom of Corundia. A place overrun by Dragons and Orcs. Now you and select others have been chosen to lead the defenses of mountain passes in exchange for lands and the title of Baron. Players will use buildings with special abilities, king’s aid cards and units of Trebuchets, Archers, and Knights to defend against units of Battering Rams, Orcs, and Dragons. Each round in Dragon Valley starts with an interesting twist. 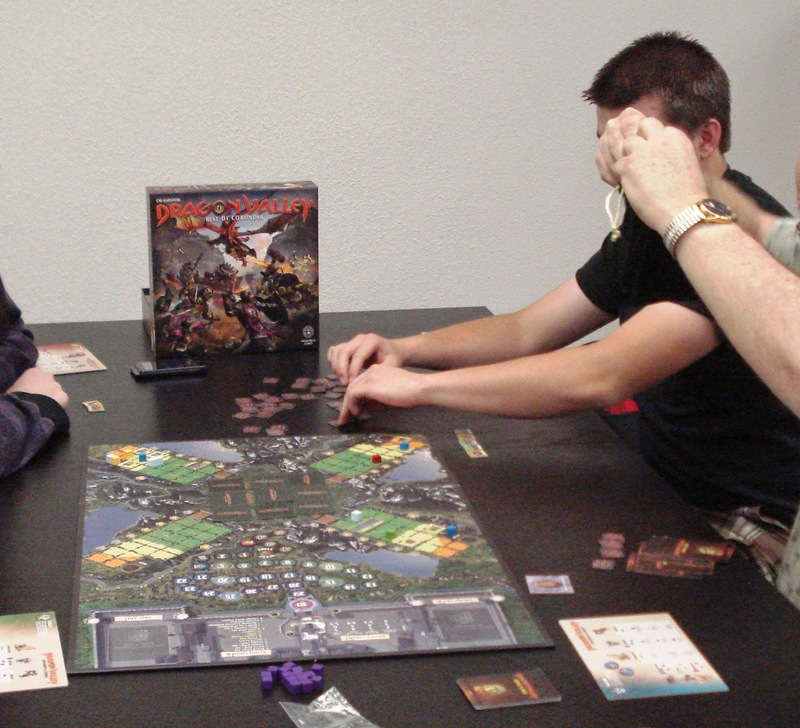 The player with the lower score randomly selects three building tiles, four king’s aid cards, and five units (a combination of good units and bad units). That player will now divide those items into piles. The other players will now select which pile they would like to take to play. The dividing player will have last choice. Next units are deployed with good units going to the keeps in their baronies and bad units to the mountain passes in their region. Now each player gets their turn to either move friendly units or build buildings before the enemies advance. Friendly units and buildings can be used to defend against the enemies. Friendly units can also be used to charge forward and lay siege to enemy territory. Points can be scored on offense. Points can be scored on defense. Points can be lost for weak defense. There are several really different strategies to score and win. The first player to score and hold 30 points at the end of a game round will be the winner and heir to the King of Corundia. We have an open copy of Dragon Valley is available in our Store Demo Library for you come in and try out. strategy game! i love it!